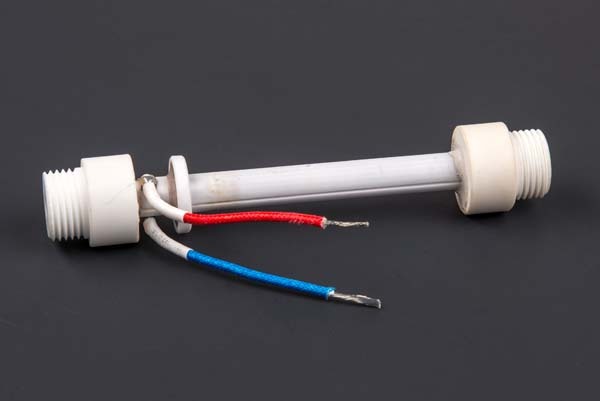 A CeraWatt ceramic heating element designed and manufactured by BCE. Composed of high temperature materials, such as tungsten and alumina ceramic substrates, CeraWatt heaters are reported to provide excellent corrosion resistance, high operating temperature, long life, energy efficiency, uniform surface temperatures, and outstanding thermal conductivity. Photo courtesy of BCE Inc. The design and manufacture of custom heating elements, thermal systems, and vacuum feedthroughs are a specialty of BCE Inc. (Belilove Company-Engineers), a Hayward, California-based company that has served the semiconductor and medical equipment industries for more than 25 years. As both a manufacturer and integrator of components, BCE offers custom electrical heaters, sensors, and controls as discrete components, or as part of a larger, value added thermal system. According to CEO Hussain Khazee, BCE is known to produce high quality and complex assemblies for a variety of applications without compromising lead times and cost. Its team of engineers is "at the full disposal of customers for all of their engineering design, manufacturing, and testing needs," he wrote in an emailed response. "We provide engineering consultations from the start of a project to its end, and have CAD modeling capabilities," wrote Khazee. "We ensure that the most optimal manufacturing methods are used for quick turnaround times and low production costs. All parts are tested, as well, based on industry and customer specified standards." The company is able to accommodate multiple revision changes to designs and provides on-site and off-site customer support for any repairs and follow-ups. BCE is ISO 9001:2008 certified and ITAR registered and compliant. Assemblies produced by BCE include machined parts that require ceramics machining, grinding, metallization, and precision laser drilling and etching. They can also incorporate several kinds of sensors, such as thermocouples and resistance thermometers, or resistance temperature detectors (RTDs), through the use of advanced proprietary epoxies. Khazee said that all of BCE's Epoxy Vacuum Feedthroughs have a proprietary seal meeting NASA's Low Outgassing Spec (ASTM E595). The company is also able to seal fiber optic cables for high vacuum applications compatible to 10-9 cc/sec, "which is very difficult to do," Khazee added. For one large semiconductor company, BCE designed, engineered, and manufactured an entire heating apparatus that needed to satisfy numerous stringent criteria, including vacuum compatibility to 10-8 Torr, and a maximum operating temperature of 200°C. It would have to operate at 1500W, 240V, and all epoxies were required to meet NASA's Low Outgassing Spec (ASTM E595). In addition to being capable of sensing temperature, the heating apparatus also needed to be a circular configuration, between 34 and 36 inches in diameter, with the height of the part not to exceed 1 foot. BCE was challenged to provide effective heat transfer from the heating device while reducing the cost of the machining. According to Khazee, the ability to provide uniform heat to semiconductor devices in degassing chambers is essential in extracting impurities. This can only be achieved if a heating device has the proper fit and temperature uniformity for a given chamber, he said. "In order to heat this company's semiconductor wafers, it was critical that the heating device be manufactured to fit precisely into a large and circular degassing chamber, posing manufacturing challenges due to dimensional and application parameters," said Khazee. "BCE was able to provide extensive design consultations, 3D CAD modeling, and lean manufacturing capabilities to this semiconductor giant at a competitive price. All these services were rendered while catering to all requirements needed to successfully manufacture their products." Khazee said that BCE's Vacuum Ring Heater proved to be the ideal product for this application. Its strong aluminum ring construction ensured effective heat transfer to the circular wafers while keeping manufacturing costs low, he explained. Its strategically embedded heater with stainless steel sheath allowed the temperature uniformity of the device to remain at ±2% at 150°C, greatly exceeding customer requirements, he added. "Moreover, BCE's proprietary epoxy, meeting NASA's low outgassing spec, was used as the primary sealant, and Kapton insulated leads were provided for the heater and integrated thermocouple to reduce contamination. In fact, the integrated thermocouple type K further served to monitor the temperature supplied to the chamber. Finally, all electrical, vacuum, and dimensional requirements were met to provide the most optimal thermal environment." In addition to semiconductor and medical equipment, BCE (https://heater.belilove.com) serves industry sectors such as aerospace, agriculture, automotive, and energy. The company also does work for the government and defense, transportation, and telecommunications sectors, among others.